Kenya is now set to partner with DRC in capacity building by offering training opportunities to Congolese public servants in Kenya’s training institutions such as the Kenya School of Government. ‘’Our partnership will ensure that the countries achieve our founding fathers’ dream of a stable, secure and prosperous African continent. We are ready to partner in building infrastructure, sharing skills in the extractive industry and in many other areas of mutual benefit,” President Kenyatta said. 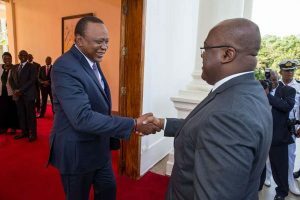 On his part, President Tshisekedi thanked Mr Kenyatta for being a true friend of DRC as demonstrated by his visit to the country to attend the Congolese leader’s inauguration ceremony.